IHS Markit flash PMI surveys will provide early insights into the performance of major economies at the end of the third quarter, in a week in which the main monetary policy action comes from Japan. With another Fed rate hike widely touted for later in the month, the US dataflow will be watched closely for potential dampeners on the FOMC's appetite for tighter policy, especially any signs of detrimental impact from escalating trade wars. 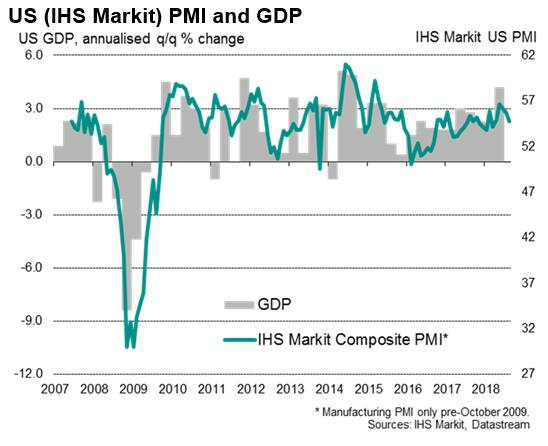 The flash PMI survey data from IHS Markit will help by firming up the survey's GDP signal for the third quarter, which is currently running at just under 3% annualised. However, the August PMI data also showed some loss of growth momentum, especially in the manufacturing sector. Tariffs and trade war worries were reportedly driving up prices and hitting supply availability, all of which will concern the Fed. 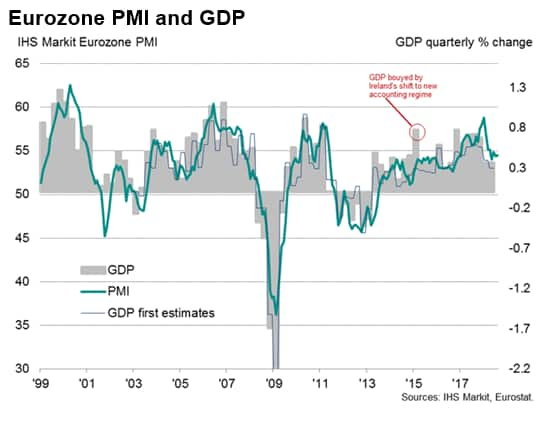 With the ECB moving towards halting its asset purchases by the end of the year, policymakers will be hoping that the flash Eurozone PMI update will send a more convincing signal of robust economic health after mixed signals in August. Although the headline PMI rose to indicate that the region is on course for another quarterly GDP expansion of 0.4-5%, business optimism about the year ahead dropped to the lowest for almost two years, reflecting growing concerns about the impact of trade wars, rising prices and heightened political uncertainty. Furthermore, the upturn looked increasingly uneven. Although robust growth was again seen in the core countries of France and Germany, Spain and Italy were notable in reporting slower rates of expansion. Price pressures also varied markedly across the region, ranging from near-record inflation in Germany to falling prices in Italy. In a week which sees the Bank of Japan meet to set monetary policy, analysts will be watching Japan's PMI and inflation data especially keenly for clues of future monetary policy. The consensus is for mild annual growth of 0.9% in core inflation, the central bank's preferred price gauge. Markets will be looking for guidance on monetary policy at the Bank of Japan, though no change is expected after the central bank tweaked policy in July. Rates on government bonds are now allowed to trade in a wider band as the government seeks to scale back its vast asset purchase programme, though the Bank also helped drive the yield down through additional purchases and reiterated that interest rates are unlikely to rise for "quite some time". 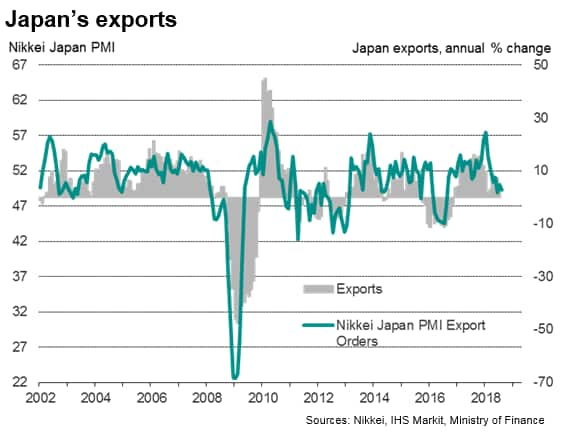 The BOJ is expected to voice particular concern about global trade issues amid signs of slowing export demand, with the latest PMI surveys indicating that export growth has faltered dramatically. The flash Nikkei Japan Manufacturing PMI will therefore be eyed for an updated view into manufacturing and trade performance in September.